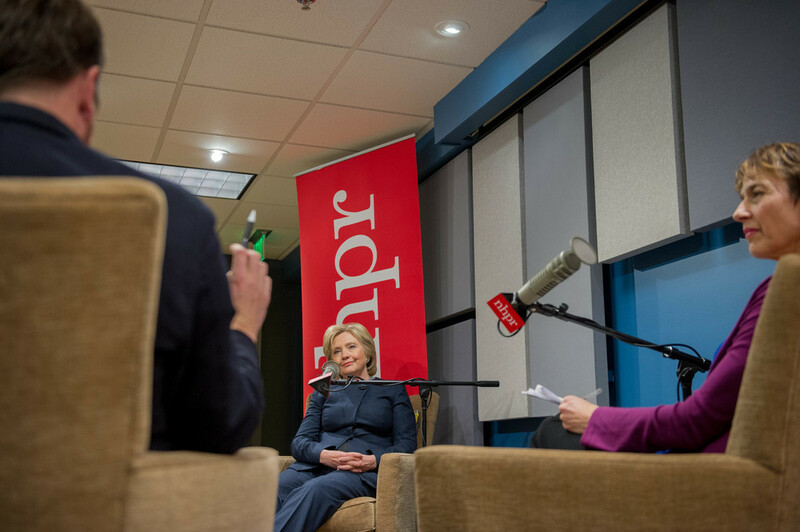 State of Democracy is a multi-platform enterprise journalism initiative that will focus on the impact of public policy and politics on the lives of the people in New Hampshire and beyond. 1. To report on the forces that shape, inform and influence events, ideas and actions. 2. To explore the potential impacts that Statehouse and Congressional decisions have on the day-to-day lives of a broad range of Americans. 3. To follow New Hampshire’s federal, state, and local politicians to raise awareness, increase accountability and elevate civic discourse and participation. 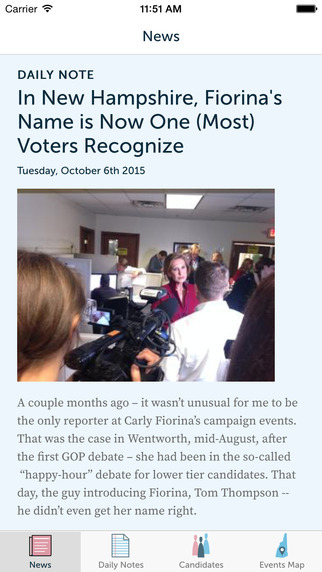 Ruth Graham reported for Slate and Politico during the NH Primary. She was one of several reporters who shared the State of Democracy app on social media in the run-up to Primary Day. In addition to radio stories, interviews, and program segments, State of Democracy will have a robust online presence that will include journalism, interactive tools, policy and civics explainers, and more. The flagship digital component of NHPR's State of Democracy initiative are proprietary online portals designed to function as a companion to the electoral process. Much like the successful apps launched by journalism outlets like Politifact, the State of Democracy is envisioned as an intuitive interface for "political junkies," voters, educators, and policy makers to access the team's journalism, voter tools, maps, and fact-checking projects. Launched in its initial form for i0S in January, the app centered on the 2016 New Hampshire Primary. In the days leading up the the election, journalists from national outlets shared and tweeted about the app as a resource to help them with their coverage, and active installs of the app numbered over two thousand. NHPR's news and digital team are currently planning the next iteration of the app as we look ahead toward 2018 and the 2020 race. Concepts for the next generation of the app include an interactive audio and video recording feature, push notifications for breaking stories and results, an "NHPR on the trail" feature tracking reporters in the field, interactivity with the elections database, and coverage of New Hampshire oriented politics and policy stories. The State of Democracy team will continue to create and launch online tools designed to enrich and supplement NHPR's on-air political and policy reporting. The tools will be practical, informative, interactive, and engaging. They will also serve as resources for voters, educators, citizens, and journalists by creating experiences designed to increase the transparency of local and state governments, electoral spending, and civic processes. Sample engagement opportunities include: online and town hall forums, first person storytelling, candidate forums and debates, “brews and news” gatherings at bars across the state, and audience surveys. Partners may include: young professionals associations, National Public Radio (Washington, DC), The Carsey Institute, Vermont Public Radio, Maine Public Broadcasting, public radio stations in candidates' home states, public radio stations in other primary states, and potential podcast partners. State of Democracy will be managed by News Director Dan Barrick, who is also project manager for the initiative. Since coming to NHPR in the spring of 2015, Dan has led or co-led several projects including the newsroom's coverage of the New Hampshire primary, the creation of a comprehensive Primary Voters' Guide, the implementation of the NHPR Elections Database, the State of Democracy mobile app, and a new Politics and Policy blog. Dan has also become a regular panelist on The Exchange, as well as an interview subject and contributor to national news outlets including PBS Newshour and the Diane Rehm show. He has also reported and written stories and blogs focused on the data behind the state's politics and policy.